Traditional chile pepper, garlic and black pepper. This is a spicy recipe with black pepper and chile powder. SuckleBuster's award winning recipe is included on the label. 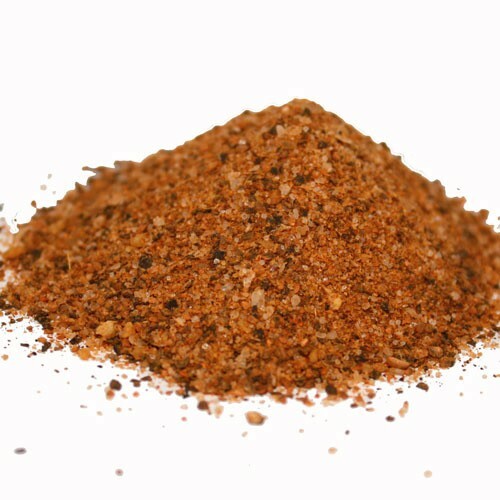 It is a traditional, Texas-Style seasoning and excellent for grilling beef, chicken pork or any meat. 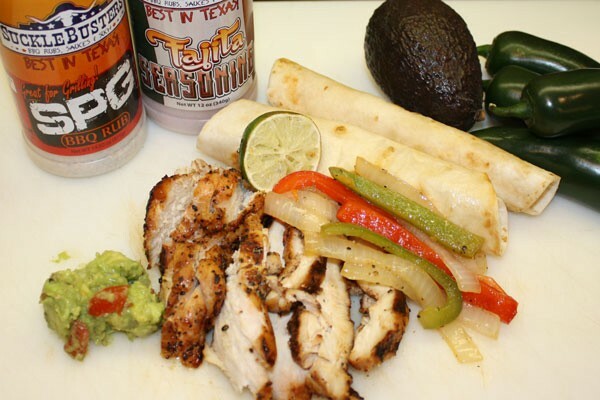 The quick and easy recipe is (included on the label) will serve about 2 lbs of fajitas. Hot and Spicy. Use on: Beef and chicken. Ingredients: Sea salt, black pepper, garlic, chile pepper, paprika, sugar, cumin, onion, silica & spices. NO MSG. Naturally Gluten Free. Wash, rinse and dry the chicken breasts and put in a 1 gallon plastic zip-top bag. Add 1/4 cup soy sauce and the Fajita Seasonings. Shake until the chicken is evenly coated. Place the bag with the chicken in the refrigerator and allow marinading for about 1 hour or up to overnight. The goal is to lightly marinade the vegetables and allow their fresh flavors to come through. Slice the peppers and onion into 1/8 inch thick slices and place in a deep sided cast iron pan (or other pan suitable for the grill). Drizzle on the olive oil and sprinkle on the SuckleBusters SPG seasoning. Last, squeeze on lime juice from 1/2 lime. Gently toss to coat all the vegetable evenly. Set aside to rest while your grill is coming up to temperature. Prepare your grill for medium-high heat and direct cooking. Cook the chicken and vegetables side by side. Vegetables - place cast iron pan directly on the grill and cook the vegetables. BEWARE the pan will be extremely hot, use appropriate gloves for handling the hot pan. Stir the vegetables to prevent burning. The vegetables start to sizzle and turn translucent when done. Remove from the grill and reserve for assembly. Chicken - place the chicken directly on the grill. The chicken will take approx. 20 minutes cooking time depending on the thickness of the breasts. Flip about half way through the cooking time. The juices in the chicken will run clear when done. When in doubt, cook chicken to to 160 degrees internal temperature. Remove from the grill and squeeze on fresh lime juice. For best results, pre-warm flour tortillias, wrap in heavy duty tin foil and place on the grill to warm while cooking the vegetables and chicken. Aftre removing from the grill, allow the chicken to rest for 3 minutes, then slice into small strips, add to the flour tortillias, top with the cooked vegetables and other fixins to complete. Roll and serve immediately. Enjoy!